Powers: As the possessor of the magic pen he is granted a bond with the genie there in. The genie’s power is limitless in our dimension but misunderstandings and mispronunciations often cause problems for the two. 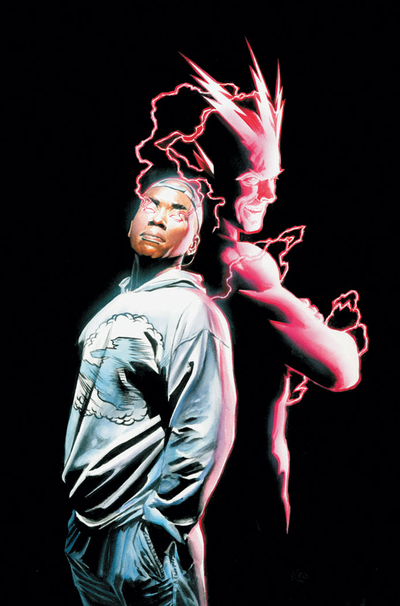 Jakeem is an African-American teenager and Black Superhero with a tragic past. His father does not know of him and his mother died of cancer soon after he was born. He’s from Keystone City, and came to possess the genie-powered Thunderbolt pen which once belonged to the golden age hero Johnny Thunder who was suffering from Alzheimers. When an evil genie came to Earth, Jakeem was instrumental in saving the planet when he was able, with Captain Marvel’s help, to merge his genie with the evil one thus ending the threat. The now fused genie is summoned by saying the words “So Cûl” (pronounced “So cool”). He then became a reluctant member of the renowned Justice Society of America. Here he made friends with Fellow Black Superheroes Mr. Terrific, Amazing Man and Lightning.